﻿ Handy Library Manager: How to return a library item in the Manage Loans window? Help, how to topics > Tracking circulation transactions > How to check in items in the Manage Loans window? 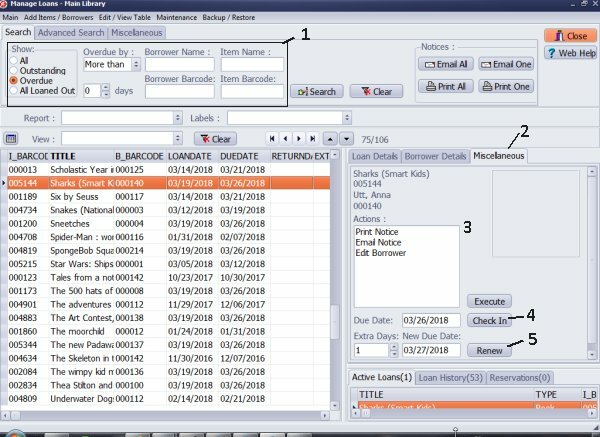 How to return a library item in the Manage Loans window? The main purpose of the Manage Loans window is to allow librarian analyze all circulation activities in the library. It may be convenient for a librarian to process returns and renewals here. This topic explains how to process check-ins in the Manage Loans window. On the Search (1) tab define search: display all overdue items or overdue items for the selected borrower. Select the loan transaction on the grid. On the Miscellaneous (2) tab click Check In (4) to check the selected item in. There are additional actions that you can execute: Print Notice, Email Notice, Edit Borrower (3), Renew Item (5).